Love these crisps, and now all flavours are just £1 for a large 150g bag at Morrisons.Also worth mentioning that Morrison's own Signature range kettle crisps are also only £1. Asda have these for £1 too. Everyone wants us to spend money! Found the Lidl ones same quality, normal price is 79p, keep a look out for thier specials, couple of week ago they were 39p. Same price tesco as well I believe. bought source cream yesterday for a quid. Didn't pay attention to rest. Same price tesco as well I believe. bought source cream yesterday for a … Same price tesco as well I believe. bought source cream yesterday for a quid. Didn't pay attention to rest. ​Yes Tesco as well. Got a few different packs yesterday. Found the Lidl ones same quality, normal price is 79p, keep a look out … Found the Lidl ones same quality, normal price is 79p, keep a look out for thier specials, couple of week ago they were 39p. I sense impending attacks from the 'designer label' brigade. These are an evil crisp. Mature cheddar are impossible to just have a couple. Ok why is it funny? I like Kettle crisps, ate far too many, and I tried the Lidl ones when they were on special, they were much better than Kettle crisps, fewer flavours admittedly and still tasted better adn appeared to be better quality. You've already contradicted yourself, first you say same quality, now the … You've already contradicted yourself, first you say same quality, now the lidl crisps are better.The lol is because on every "branded" food thread, there is someone going on about lidl. It's really of no relevance is it? ​I tried them yesterday, didnt like them but they did sound so appealing. I wonder what they mean by "hand cooked". I mean, REALLY. On a large industrial scale, hand cooked. Can someone explain? Still, not a bad price as it equates to 6 x 25 gram bags for a quid. I wonder what they mean by "hand cooked". I mean, REALLY. On a large … I wonder what they mean by "hand cooked". I mean, REALLY. On a large industrial scale, hand cooked. Can someone explain? Still, not a bad price as it equates to 6 x 25 gram bags for a quid. We did a blind taste-test between Kettle Chips and Lidl's equivalent (both pepper flavour), and most of us preferred Lidl's. 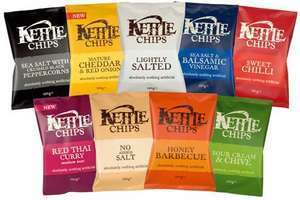 I had expected Kettle Chips to taste better or both to be the same but the difference was quite noticeable. So when Lidl's crisps are half-price at 39p, it is a significant difference. They really are, but not mom & pop style, I remember seeing it on an episode of 'How's it Made' or something, and basically the crisps are cooked in a giant fryer by a person using a very large basket drainer, and then tumble seasoned, rather than a 'donut robot' style machine which does the whole thing on a mass scale. We did a blind taste-test between Kettle Chips and Lidl's equivalent … We did a blind taste-test between Kettle Chips and Lidl's equivalent (both pepper flavour), and most of us preferred Lidl's. I had expected Kettle Chips to taste better or both to be the same but the difference was quite noticeable. So when Lidl's crisps are half-price at 39p, it is a significant difference. I guess they don't have the variety of flavours, but at that price worth trying, thanks for sharing.